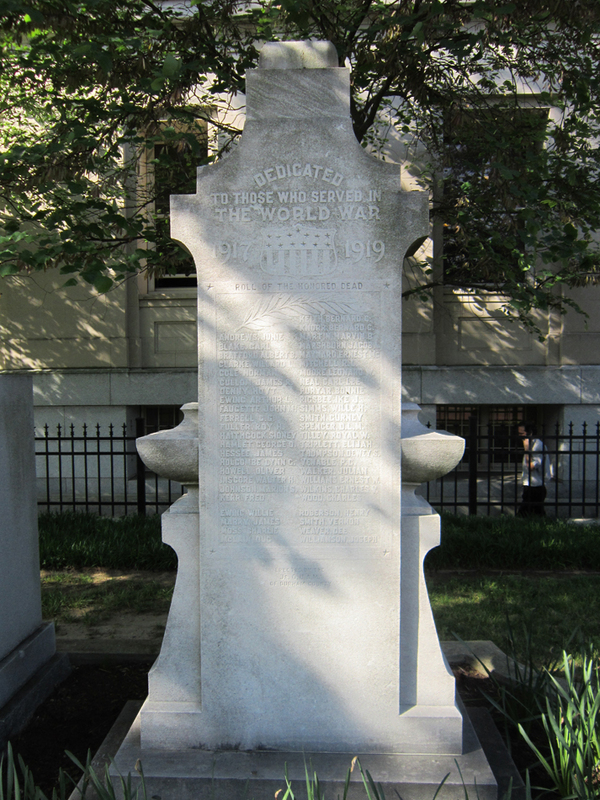 Source: Durham County World War I Memorial, photo by Donald Burgess Tilley Jr. The shape of the Durham WWI monument is unusual. It is a rectangular monument with curved embellishments on its sides. Near the top of the memorial is a an American flag shield. A palm branch is carved above a list of Durham residents who died during the war. Introductory Remarks: Presentation of Flag and Pole—C.W. Stallings. Acceptance of Memorial, Flag and Pole—L.P. McLendon. Laying Wreath on Memorial, “Taps,” bugle. Tolling church bells two minutes. The Memorial, as constructed, lists all names of Durham County citizens killed in World War I, but separates the list according to race. The names of African American soldiers (beginning with Willie Ewing) are engraved on a separate line. The Jr. Order of United American Mechanics was a patriotic fraternity known in North Carolina for its charity work and involvement with education in the community. Its best known achievement in North Carolina was the orphanage it opened in 1928, the American Children’s Home in Lexington, NC. The Durham Chapter was founded in 1901 and had 250 members by 1912. Although the organization raised initial funds for an orphanage in Durham, the plans were never executed. At the Board of Commissioners’ June 3, 2013 Worksession, Mr. Eddie Davis, representing the Durham Appearance Commission, appeared to request that the Board of County Commissioners consider adding a small plaque at the bottom of the World War I Memorial. The Appearance Commission asked that the plaque provide one alphabetical listing of the names of Durham County citizens who were killed in action during World War I. Following Mr. Davis’ comments on June 3, 2013, the Board asked staff to research the issue and to come back to the Board with recommendations. Staff began researching the request, as well as reaching out to local Veterans organization to make them aware of the proposal. On July 25, 2013, Deputy County Manager Lee Worsley received a letter from the American Legion, Durham Post 7, opposing the proposal to put a plaque directly on the WW I monument. The letter states a preference of "a plaque, separate from the Memorial showing an explanation of why the Memorial was prepared as it is." Following receipt of the letter from the American Legion, Deputy Manager Worsley met again with the Durham Appearance Commission on August 22 to discuss an alternative concept. The alternative proposed would involve constructing an informational sign next to all three of the war memorials (World War I, World War II and Korea). The sign would discuss the history of all the war memorials, including providing a way for citizens to get more information on the Memorials (probably through a QR Code). The sign would also address the separation of the names on the World War I Memorial and include a relisting of the names, if deemed appropriate by the Board. The Appearance Commission endorsed this alternative approach at their August 22 meeting and it is the approach being recommended to the Board of Commissioners. In October 2013, the County Manager recommended that the Board direct staff to include the design of a war memorial information sign as part of the Durham Social Security Demolition and Redevelopment Project. Located in front of the Durham County courthouse, this monument stands next to the Durham County World War II and the Durham County Korea and Vietnam Veterans Monuments. There is a Confederate monument on the other side of the entrance to the Old Durham County Courthouse building. The monument was approved by the county commissioners in June, 1921. The approved design was of marble and included a water fountain, but the ultimate monument was granite with no water fountain.